The title for this panel is a bit of a misnomer really, as there is quite a bit of lead included in the design, but I was trying to use the ‘light lines’ instead of ‘lead lines’ to make the difference. 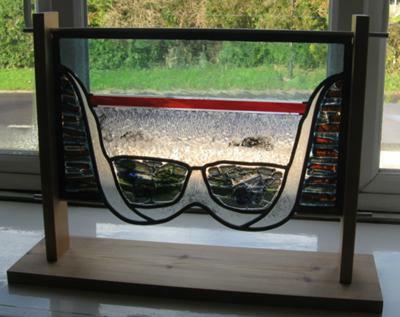 I love this piece of work; the use of handmade glass, and the minimal pieces of chunky but ordered lead give it structure. Brilliant. 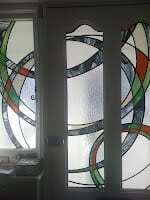 I have been fiddling with stained glass for over 4 years. Since I am a stay at home mom, my time is very limited. I made this flower for my girl’s room. They always like to play with my beads, so I was inspired to make them a flower to hang in their room. I think it turned out great. All of my projects that I have created were hand drawn; except my first three. Thank you for allowing me to share one of my works of art. I have enjoyed looking at the other’s as well! by Amy T.
Milly’s reply: Amy, thanks to you for letting us see your fantastic flower. I bet your daughters were thrilled – lucky them having a mum that takes time to make lovely things for them. 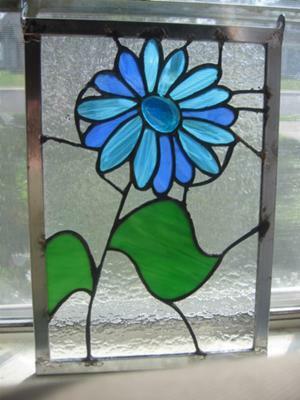 I particularly like the way you’ve managed to capture the lively quality of the flower with the lead line and your use of clear glass. 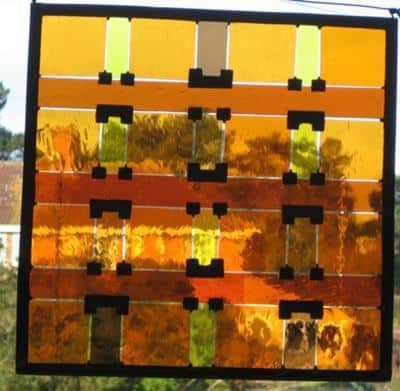 I often talk about how clear glass accentuates the coloured areas with my students, and this is a good example. It’s great that you’re designing your own work, too – it makes it so much more personal. Keep it going! I love this, it does exactly what you say – gives the impression of space beyond the boundaries of the architecture. Know what you mean about circles! They’re great for movement and flow, and lovely and gentle to have around, but they certainly arne’t the easiest shape to deal with. Thanks for your submission Anthony, it’s great. Landscape that looks like a bra! The original inspiration for this glass art piece was taken from a location in Devon where a waterfall pours over a cliff and flows across a pebbly beach into the sea. 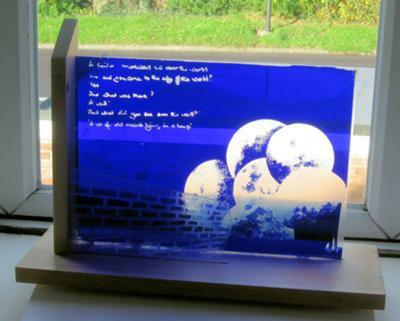 This annual competition requires a sample panel – made to full scale size – from an original design of the entrant. 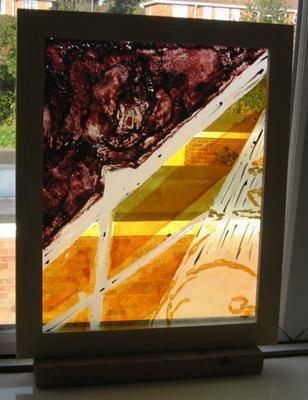 The panel was made from a single piece of float glass, enamelled, silver stained and etched with acid paste. A small red shard was glued to the surface.